Your cPanel password can be reset from within the Account Management Panel (AMP) or after logging into cPanel. In this guide we will show you how to do both. Did you know? You can create multiple cPanel accounts with our Reseller Hosting packages. 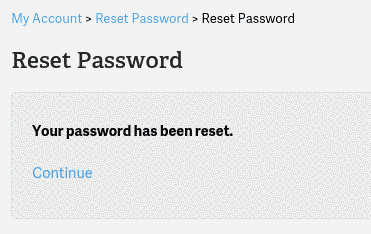 The Reset Password page will load, fill in your new password twice and click SUBMIT. You will then see a message stating Your password has been reset. Please note you must know your current cPanel password to change it in cPanel. You can change your password by filling in the fields and clicking Change your password now!. Be sure to use a strong password. Way to go! 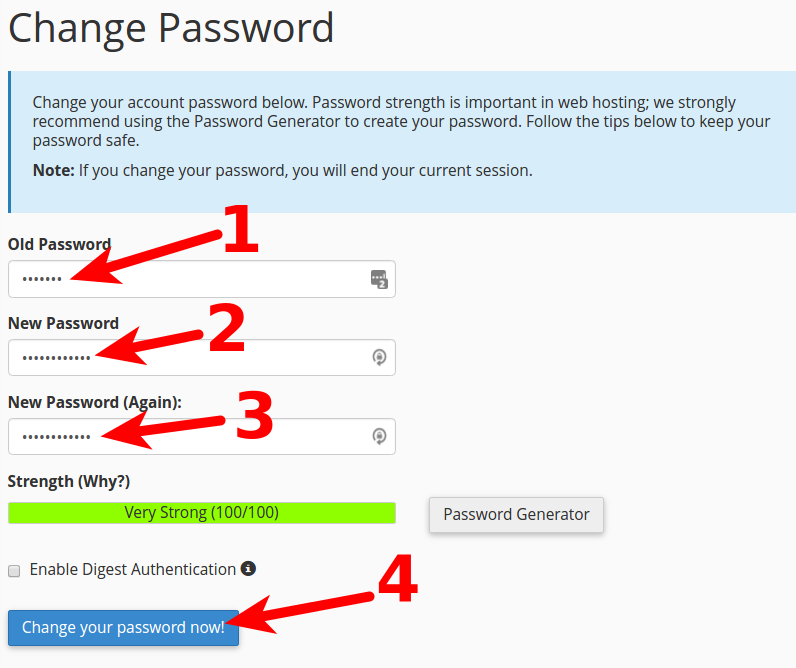 You should now be able to log into your cPanel with your new password. hi I have accidentially generate and reset password without record and now I can not log in to the cpannel as well as I don't know what user inside the cpannel to reset password. I recommend resetting your password via AMP as described above since it does not require you to know the original password. If you are unable to reset your cPanel password following the steps above, I recommend you contact our Live Technical Support for further assistance with your account. I want to give cpanel access to third party/ what is the secure way/ creating account with developers? There is only one login per cPanel, so you can provide this to your developer, and it is best advised to update the password when the developer no longer requires it. Here is a link to some helpful information on how to remove developers access. It outlines all the necessary steps. If your problems persist, I recommend contacting Live Support so they can test your specific account and troubleshoot further. Couldn't log back into C-Panel after changing password. My ID changed to something else. I have no clue what . . I recommend changing your password in AMP, since you do not need to know the original password. You can also view your username in the Account Technical Details section. is the "support center login" on this page yet something else that needs another username and/or password? I actually know my cpanel username and password--that is, I have a record of it--but since I can't login I don't know which is wrong. Your cPanel user name and password are not the same as a login for our Support Center. You will need to create an account separately for the Support Center, and login with those credentials instead. There is no Change Password field. There are fields for the new password and then a change password button. amrurice, for more direct assistance with this issue, I would recommend <a href="http://www.inmotionhosting.com/support/website/website-troubleshooting/how-to-get-great-technical-support">contacting our Support team for more direct assistance with this issue</a>. I don't have cpanel in my AMP ? Mahfoudimad, do you have website hosting with us? If so, are you certain that you have only one account? If not, you may be logged into a secondary account. You may wish to <a href="http://www.inmotionhosting.com/support/website/website-troubleshooting/how-to-get-great-technical-support">contact our Support team</a> to clear up this situation. After changing my cpanel password, I cannot login to my cpanel. Is it possible that my cpanel account was supended ? I advise resetting the password again and trying the new password. Otherwise, you will need to contact our Live Support team for further assistance. We have a problem in our email. We can't open the message com on this way LOG IN ATTEMPT FAILED. Please help us how to open. We're waiting your response soonest. As a test, try changing your email password and logging in again. On my reseller account, for a few of the Word Press sites, any change in the cPanel Password results in the site going down, with a message "Cannot connect with database". Changing it back to what it was before brings the site back up. Why is that, and how can I change the Password for those sites? cPanel password changes should have no effect on the sites themselves. If it continues, you may want to contact the Live Support to see if they can find out the source of the issue. hello guys, ca'nt access to my cPanel, from the first day, I always access to there from AMP, today try to made the same, but not workink, then, do try reset the passw from AMP and all ok, the message is that the passw is changed, continue, but when try to login in cPanel again with the new passw, not working. You should be able to login to cPanel directly without issues. If your problems persist I recommend contacting Live Support so they can test within your account, or help you reset your cPanel password. t want to crreate account AMP. what i have to do. Thank you for contacting us. When you sign up for a Hosting Account with InMotion, you will be given access to AMP (Account Management Panel). Thank you for contacting us. Sorry to hear you are having trouble with your account. If the link in AMP is not working, you can login to your cPanel directly without going to AMP. But, I recommend contacting Live Support, so they can test the link in your AMP and fix any issues. You can view your correct cPanel Username in AMP, at any time. Thank you for your post, sorry to hear you are experiencing issues. You can update your credit card in AMP at any time. Live Support is available 24/7 365 days a year, feel free to contact them for assistance. There is no wait for phone support at this time. Hello John, Thanks for you help bt till then it didnt work out in my case. It still giving me error telling that "network error, try again and contact your network service provider"
I dnt knw wat cud be the probs? Sorry to hear you are still having trouble. Did you attempt to contact your your network service provide? At this point it would would be most helpful to see the results of your Ping and Traceroute. If you do not want to post it here publicly, please contact Live Support. "network error occur while you are trying too login, contact your network service provider"
Sorry to hear you are having trouble logging into cPanel. Next, perform a Ping Tracert to your website. If you have any further quest ions, feel free to post them below. Sorry to hear you're having problems with your cPanel password. The information provided above is for recovering a cPanel password for an account hosted with InMotion Hosting. If your domain is NOT hosted with us, then you will need to speak with your host in order to determine how to recover you cPanel password. The instructions above for resetting the cPanel password would require that you already be able to login to the cPanel - and the Account Management Panel (AMP) instructions do not apply to non-Inmotion Hosting accounts. Hello! I tried to login into my cpanel using a password that i've created, which is not the same of amp login, but i can't connect. I'm sure that the password is right, what can i do? I tried to reset password but did not work. Be sure that you have the correct cPanel username as this would not be the same as AMP. Your username will be listed in AMP within the header for those account options. This will be 7 characters ending with a number. I logged in with cpanel user listed in technical details of my account (7 characters ending with a number), but I see this message: "login invalid". Yes, that is the correct cpanel username format. You may want to check and even reset the cpanel password via the AMP. Failing that, please contact the Live Support team for further assistance as it may be something particular to your account. Thank you for contacting us regarding your site getting hacked. I first recommend following our guide on Recovering from a hack. It includes steps you need to take to help prevent a repeated attacks on your site. I also removed your site name from this public forum post for security purposes. 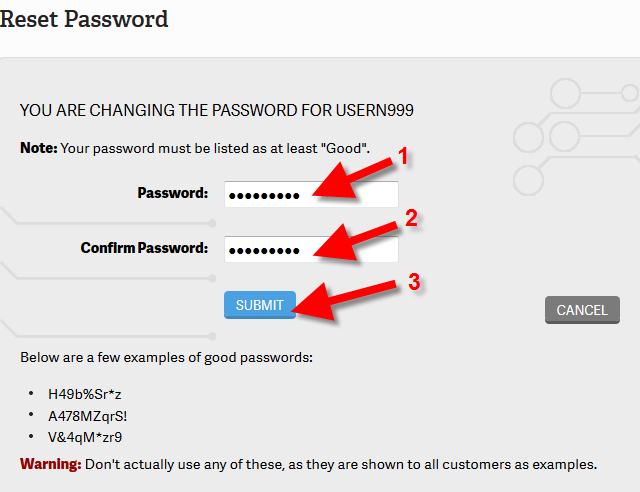 plz tell me how to reset the website password and Username from Cpanel. There can be many passwords involved in a website. Which password did you mean? You said not the cPanel website. Did you mean the AMP password by chance? If not, please give a few more details. what if I don't know my cPanel password?? The section entitled "Reset your Password within AMP" is how you can reset your cPanel password without knowing the current one. I wish to know how to create another user account for a lower administrative level? Unfortunately, this would not be possible in cPanel. We just recently fired another employee. I just want to make sure that person cannot access their old company account without the assistance of our web administrator (via the master cpanel account) Please advise. As this guide explains you can change your cPanel password, which would deny access to anyone that still just had the old password to access the account. Now take note that you might want to also update your billing and contact info in AMP to ensure your ex-employee doesn't retain any control over not just your cPanel, but your account with us in general. We verify accounts with the last 4 digits of the credit card on file, or the original cPanel password of the account. So if this ex-employee knows this information, you can request to update it in your ticket. Thank you for your comment. You can reset your cPanel password from AMP, as described above. To reset your password you need to remember the old password... what do I do if I don't? Thank you for your question. You can reset your cPanel password from AMP without knowing the original password. If you do not know your AMP password, you can reset it via your primary email address. I can't remember my password to get into cpanel.